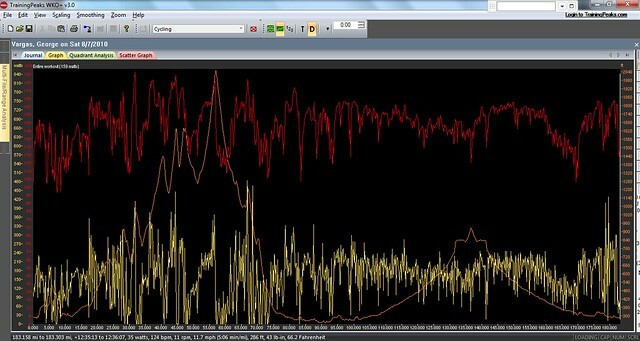 Notice on the screenshot from Training Peaks WKO 3.o how the first 90 miles the power (yellow lines) is all over the place. After finishing the group ride notice how my power is much more steady. Also notice the last 15 miles how the power is much higher than the previous section. I wanted to finish the ride strong and I DID!! I am pleased with that effort and it is very promising sign that my fitness is progressing. After 170 ish miles the last 15 miles were done at a higher intensity! I had a good day on the bike today. I started off with a 90 mile group ride — the Canyon Velo ride. But I didn’t feel satisfied with the amount of work I had done so I rode some more afterwards. Riding in packs doesn’t really prepare me for my races. The group rides are frustrating for me. They stop to regroup, they stop too long, and the effort is very dynamic. They ride at an easy to medium pace until they hit the hills. When they are in hills they go balls out and it’s an anaerobic effort. All the things that don’t translate well to in Ultra riding. Ultra racing in its purest state is a more akin to a time trial– a very long time trial. For example the Furnace Creek 508 is raced as a 508 mile time trial!! I guess that’s why I prefer to train alone. Just my SRM Power Meter and I going out for a 13 hour training ride. And on race day I guess that’s why Ultra Cycling appeals to me– it’s all about individual effort! Just you and your bike against Mother Nature’s choice of weather and Planet Earth’s topography. Ok all for now…thank you for reading my blog. Please pass my blog along to your friends. Why people that ride & stop & sit-down eat….and still call themselves “Endurance Junkie” or something equally ridiculous is mind boggling. I took a 112 mile/13,000′ stroll across the San Gabs with only one stop(ten minutes to fill bottles & eat free cake at a Ranger station) and I feel…finally…that I understand what ‘long riding’ is about. I felt strong at the end….proof, to me at least, that you have to break thru some barriers to find the right stuff in yourself. Its nice to stop when riding with friends and its social and enjoyable.I cycle a lot on my own but might do 50 mile with a club and then do some more on my own.Its nice to mix it up.There is nothing wrong with stopping as long as you still get in the training and do a long spin without stopping infrequently.Going anaerobic is good too as you get to push your muscles harder than you do normally and this has substantial benefits for long distance cycling.